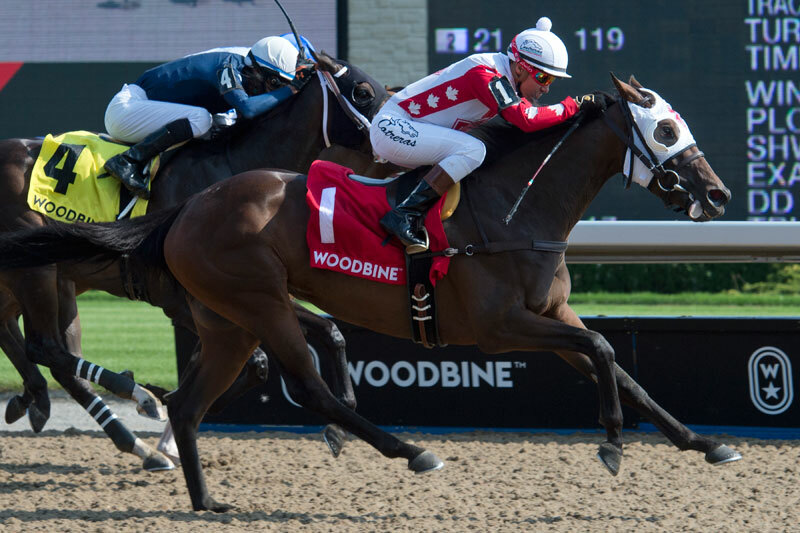 Trainer Andrew Smith and owner Joey Gee Thoroughbreds will send out the one-two punch of Line of Vision and Stormy Summer in Saturday’s $100,000 La Prevoyante Stakes, at Woodbine. A daughter of Court Vision, Line of Vision arrives at the La Prevoyante, an Ontario-sired race for three-year-old fillies, off back-to-back third-place finishes in added-money events. On September 29, Line of Vision finished third to Zestina (who she’ll face again on Saturday) in the Ontario Damsel Stakes, a one-mile race run over the E.P. Taylor Turf Course. The bay also took show honours on the grass in the 1 1/8-mile Carotene Stakes, on October 20 at Woodbine. Smith, in the midst of a career season, believes Line of Vision will appreciate a return to the main track in the 1 1/16-mile La Prevoyante. A lifetime winner of four races, along with three thirds, from nine starts, Line of Vision already has three stakes score to her name, taking last year’s editions of the Victorian Queen and South Ocean. In August, she won the Eternal Search after a seventh-place finish in the Lady Angela two months earlier. Stormy Summer, a daughter of Sligo Bay, will get her second shot at a stakes score in what will be her ninth lifetime start. Two starts ago, the bay ran a strong race to finish second, only a head back of Bear Paw (who will also contest the La Prevoyante), in the 1 1/16-mile Classy ‘n Smart Stakes. Sent off at 16-1, Stormy Summer dug in gamely down the lane, and just missed notching a victory in what was her first stakes appearance. She heads into this weekend’s engagement off a fourth-place effort in a 1 1/16-mile main track race on October 27 at Woodbine. “Her last race, we hadn’t planned on going there,” offered Smith. “We were going to give her about six weeks and run her straight into this stakes race. But that race was there and it was a last minute decision to go in. Smith is hoping he can say the same on Saturday afternoon. Bred in Canada by Jean-Louis Levesque, La Prevoyante was a champion in her home country as well as the United States. Undefeated in 12 starts as a juvenile in 1972, La Prevoyante won the Eclipse Award for Champion Two-Year-Old Filly, as well as the corresponding Sovereign Award that year, and was also honoured as Canadian Horse of the Year. La Prevoyante’s career record of 25-5-3 from 39 starts and earnings of $572,417 led her to be inducted as part of the inaugural Canadian Hall of Fame class in 1976. She was inducted into the National Museum of Racing’s Hall of Fame in 1995. Slated as Race 8 (4:42 p.m.), the La Prevoyante is part of Saturday’s 11-race card. First post is 1 p.m.